May 4 of the Lunar Calendar is best known on Okinawa as the day of Haarii races at various fishing ports around the islands. But Harii is not only a boat race but involves many ritual meanings. For example, prior to the races a holy ceremony for the gods of the sea is performed early in the morning of the day at local shrines. It’s also a special day for children called ‘Yukkanu-hi’. Okinawan Popo look much like crepes. It’s almost like the local version of the Children’s Day in the beginning of May that is a national holiday for praying for the healthy growth of children. On Yukkanu-hi parents used to buy new clothes for their children and dress them up for the festival. Even now, stalls of colorful toys are lined up at the Haarii festivals, and children are excited about going out with parents to enjoy the special day. In the old times it was one of the few chances for children to be given toys. 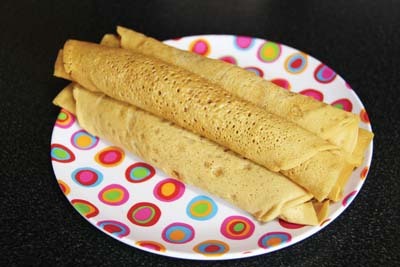 They were also given ‘Popo’ or ‘Chinbin’, brown sugar flavored crepes cooked at homes, and offered to children before the family altar, wishing for family health and children’s growth. It was a special moment for children and family to enjoy Popo because sugar used to be a valuable seasoning in Okinawa. There still remain folkways to cook Popo at some places, especially on the outer islands, but nowadays commercially made Popo are sold at supermarkets, traditionally during the Haarii season, but in many places around the year. Just take a look at a counter selling bakery products or, during the Haarii season, special treats of the season when shopping at a local supermarket. There in the course of the year you could be able to learn about annual Okinawan events and traditional snacks related to them.